We have an opening in our Longarm Certification Class this afternoon (Monday) at 2:00. Only one! Click here to register. Block of the Month - Beginning this year, our block-of-the-month groups share an open sew day in our classroom each month to work on their blocks, usually the third Wednesday. You can be registered for any or all of our on-going block programs to participate in this sew day. The first meeting for each BOM will have a private class, followed by the shared sew-day each month. We are starting with Cadence Court on March 28th. Register here for Cadence Court. This month's Hoop Envy Club will stitch together these fabulous wallets! Register early - seating is limited. Meet BERNINA educator Mary Beck at this event! She will be conducting the Overlocker Lab in our classroom. Choose from a morning or afternoon session (9:00 or 2:00) to experiment will all the threading and stitch choices of BERNINA L450 and L460. 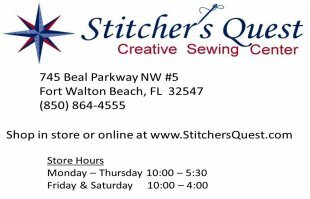 SQ will be providing the sergers. This three hour event has limited seating, so register early. SQ requires additonal certificatoin to use our BERNINA state-of-the-art system for automated quilting in conjunction with the Q24 rental. Rental including the Q-Matic is only $25 per hour - well worth the investment! 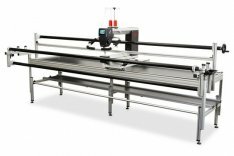 Click here to reserve a Longarm Rental date. Certification is required.